The Bosu Ball is a great tool to perform lower ab exercises, and the exercises on this page are inspired by pilates ab exercises. If you've read my page on lower abdominal exercise physiology then you understand that lower abs exercises by themselves will not get rid of fat on your lower stomach. Even though lower ab workouts will not magically get rid of stomach fat, it is important to master these exercises to stabilize the pelvis, protect the lower back, and improve functional performance. 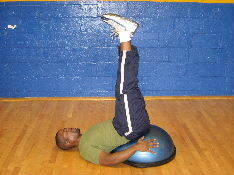 In pilates the barrel is a tool similar in shape to the Bosu Ball. Because the Bosu Ball is contoured you can get more range of motion and segmental stability. 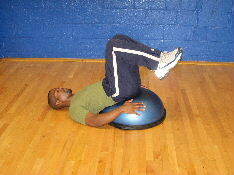 Here are 3 good lower abdominal exercises on a Bosu Ball. 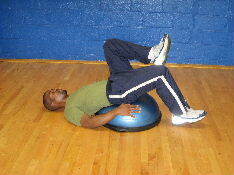 Starting Position: Begin by lying with your hips directly on top of the Bosu Ball. Keep your knees bent and your hips around 90 degrees. Form: Exhale and slowly lower one of your heels towards the ground. Gently tap your heel on the ground, hold briefly, then slowly return to the starting position. Repeat on the other side. Personal Trainer Tips: Move in a slow and controlled manner. Be mindful of the position of your spine and lower back. Do you best to maintain a neutral position at the lower back and avoid excessive arching in the lower back. If necessary use a mat, for added comfort. Starting Position: Begin by lying with your hips directly on top of the Bosu Ball and extend your legs straight in the air. Form: Exhale and slowly lower your legs until they are in a straight line with the rest of your body. Personal Trainer Tips: Be mindful of your lower back position. It is important to keep your abdominal muscles engaged so that your back does not arch excessively. If you feel your lower back arching as you lower your legs, stop at that point and return back to the starting position. 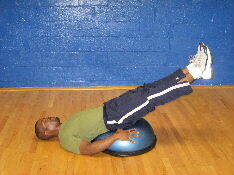 If this exercise is too difficult, stick with the marching are try lower ab crunches on the bosu ball. Lower ab crunches are an easier bent knee version of leg raises. 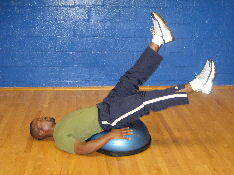 Starting Position: Begin by lying with your hips on top of the Bosu Ball. Extend your legs out to about 45 degrees. Form: Maintain your pelvic and lower back position and alternate straight leg kicks. Move in a controlled and rhythmic fashion. Perform 15-25 kicks on each side. Personal Trainer Tips: Maintaining the correct lower back position is really important. Use your abdominal muscles to keep your lower back from arching excessively. 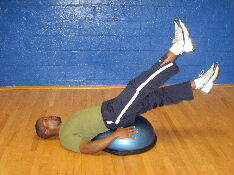 Above are 3 great lower ab exercises on the Bosu Ball. In all of the exercises, it is important to maintain your lower back position and move in a slow and controlled fashion. If you don't have access to a Bosu Ball, visit the Directory of Abdominal Exercises to learn all the other ab exercises on this site.